Getting there - Katara Lodge Katara Lodge is situated on the Great Rift Valley escarpment with uninterrupted views of the savannah, Lake Edward, Virunga, Rwenzori mountain ranges beyond in Uganda. Katara Lodge is located just off the main Mbarara – Kasese highway, about 100km north of Mbarara. After passing through Bushenyi and Ishaka, you will drive through beautiful landscape dominated by tea estates and then reach the escarpment at Rutoto. You will continue through a series of settlements until suddenly the view of the plains of QENP opens up to you in front and to your left. After roughly another 2 kms, you turn left (almost a U-turn) onto a dirt road. The turn off, about 43 km north of Ishaka, is marked by a “Katara Lodge” signpost. The first 1.5 km of the dirt road takes you through the community of Katara, after which you turn right to continue for another 500 meters through banana plantations before you reach Katara Lodge. Major road works have been completed along this route, giving you a smooth ride most of the way. After about 79km coming from Kabale (just before reaching Ntungamo town), you take a left turn onto the road leading to Rukungiri. After about 12 kms on this good tarmac road with a series of small and large speed bumps, you turn right onto a new tarmac road going to Ishaka, which is about 35km away. At the end of this road, you will reach a T-junction to join the main Mabara – Kasese highway, where you will turn left. You will then drive through a beautiful landscape dominated by tea estates and then reach the escarpment at Rutoto. You will continue through a series of settlements until suddenly the view of the plains of QENP opens up to you in front and to your left. After roughly another 2 kms, you turn left (almost a U-turn) onto a dirt road. The turn off, about 43 km north of Ishaka, is marked by a “Katara Lodge”; signpost. The first 1.5 km of the dirt road takes you through the community of Katara, after which you turn right to continue for another 500 meters through banana plantations before you reach Katara Lodge. From Fort Portal you drive through Kasese and on through the Queen Elizabeth National Park. You continue straight on the main road, passing the various turn-offs into the park, including the turn-off to the Katunguru park entry gate, driving across the bridge over the Kazinga channel, passing the turn-off to Ishasha (the Southern sector of the QENP), passing the turn off to Kyambura Gorge, driving up the escarpment and through the village of Kyambura, and finally through the village of Kichwamba. The turn off to our lodge is on the right hand side just past the Kichwamba police post and the Kichwamba sub-county headquarters and is well sign-posted. 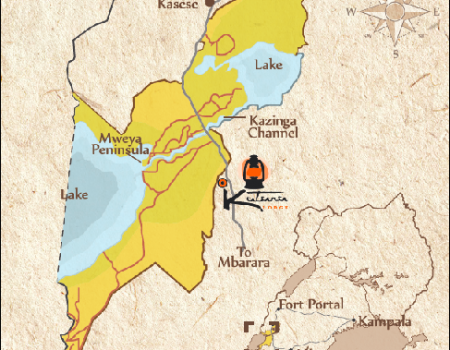 The turn-off to our lodge is at about 55 km from Kasese, or 15km from the turn-off to the Katunguru gate. After the turn-off, the first 1.5 km of the dirt road takes you through the community of Katara, after which you turn right to continue for another 500 meters through banana plantations before you reach Katara Lodge. Aerolink operates scheduled domestic flights connecting different tourism areas of Uganda to the Queen Elizabeth area. Light-aircraft flights are scheduled twice daily to either Kihihi, Mweya, or Kasese airfields, from where we can organise a pick up. If you arrive by plane, the lodge can organise transportation for the different activities in the park or surrounding areas. It is also possible to charter a flight to Kihihi from Entebbe or various locations around Uganda or other major hubs in East Africa.